Over the last four years, in Ano Pedina, is operating successfully, the course of Field Ecology of the Department of Biological Applications and Technology, University of Ioannina. The course is offered to 4th-year students of the department and its aim is to learn ecological field techniques and methodologies as also the use of analytical tools, in order to study and protect biodiversity. 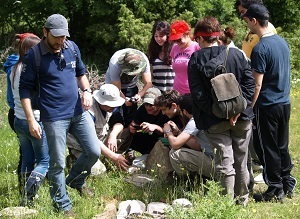 The course is conducted at the Field Station facilities (PALASE) and lasts for one week, during which the students are trained in the application of sampling techniques and methods in observing different groups of organisms in the field, the field experimental design, and the production and interpretation of ecological data. In its first year, the course involved also researchers and graduate students from the British University of Cumbria who gained unique experience and local knowledge of the region.